Pokemon Go is a unique 'phygital' phenomenon – combining both physical and digital experience. This creates unforeseen opportunities for brands to use the unprecedented power of the app for their marketing. Specially if your brand or product is focused on millennials and teens. It is the biggest mobile game ever. The object of the game is to walk around the real world to find and ‘catch’ Pokemon on your phone. Through the use of GPS technology, the player can see digital Pokemons in their surrounding area, walk up to the creature, and use the camera on their smartphone (which overlays the Pokemon on the real world) to capture it. A basic feature of the game is the ability to go to a fixed location and get bonuses from being there. These places are called Pokestops. They’re usually important or unique features of a town. A PokeStop will show up on the Pokemon Go player’s map as a place to congregate for special Pokémon, eggs, and other treats. They’re noted by a blue cube on the map. A feature of the game is the ability to go to a fixed location and get bonuses from being there. These places are called Pokestops. They’re usually associated with statues, memorials, or other important or unique features of a town. Find out if you have one nearby. If you haven't already, then download the game and pull up the map and see if you have a blue icon spinning near your business. If you do, put down a lure and watch as a whole new group of 'customers' walk into your store. At the moment, game creators Nintantic have stopped accepting submissions for PokeStops from businesses. But this should change soon, and you would be able to create a PokeStop at your location itself. Brands are finding that any posts built around the phenomenon of Pokemon Go get huge engagement. Players like sharing tips, tricks and jokes. Non-players like to ridicule the craziness. Either way you win if you can somehow mention Pokemon Go in a couple of your posts. Use social media to invite players to come play in your store. Even banks are doing it. You'll get a lot of extra social buzz with that, besides of course the footfall. Just the fact that your brand is involved in this craze can boost your social engagement quickly. Pokemon Go consumes a huge amount of battery power it requires in order to play. It needs to run data, GPS, the screen on all all times, and other features of mobile devices. And of course, a whole lot of data. You can attract players by offering free wi-fi and free battery charging stations. Announcing this on your social media will get a huge buzz. Opening up your wi-fi is a huge lure for Pokemon players. Pokemon are all over the world and pop up in random places. If a Pokemon shows up at your location, immediately jump on Instagram, Twitter, Facebook and Snapchat and announce that 'Pikachu' or 'Lunella L' is around.. If you’re fortunate to have a rare Pokemon visit your location, you’re guaranteed to see a fair amount of players rush in. Ask players to tag your business when they share photos. Depending on the social platform they share on, they should be asked to tag your business in the post or tag it as the location they were playing at. This gives your brand instant social chatter. Ideally, you should track these mentions and thank them on your posts. 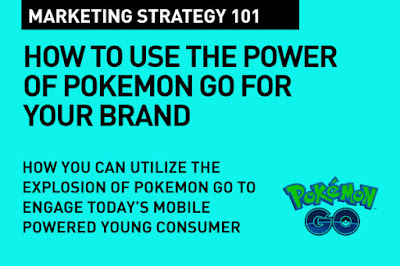 You can incentivize customers to play Pokémon and share their photos on social media. Ask players to aim Pokemon on products they want to buy, and you could offer special small discounts or up-sells and add-ons for each share. You can get your location staff to shoot photos or videos of players at your location (seek permission first). Use these on your social media. If you offer mobile service provider or sell accessories, find a way to create special services and discounts that help Pokemon Go players. T-Mobile did this by announcing unlimited data for Pokémon Go players – announcing this by using a specially created hashtag. Pokemon Go is compelling, engaging and immersive as an experience. The app uses real world video (via the camera) and combines it with a fascinating and interactive AR layer. This is storytelling in a whole new way. And that's a opportunity for many brands out there to participate in the phenomenon. A lot of small businesses are using Pokemon Go for their social media and on-ground marketing efforts, and it seems that it is really helping their brand perception and sales as well. This post should be useful for stores who want to use this mobile driven 'phenomenon' as you called it. i Really enjoy your blog of pokemon go game and found very interesting and beneficial for me .